This is my Carpe Diem Reset Girl planner I started using in the fall. I love supporting artists you design their own planner things. It makes me feel like I have something special. These cups are so super cute that Anna has designed. I am a coffee girl and a whipped cream hot chocolate girl and I have put the little latte's everywhere! The pumpkin cup is from the October box, and behind it I keep my Starbucks gift cards. She also made mug sticky note cards. SUPER CUTE. This is the last week of November and I wanted to get a little of the Christmas spirit in here and get a little festive. 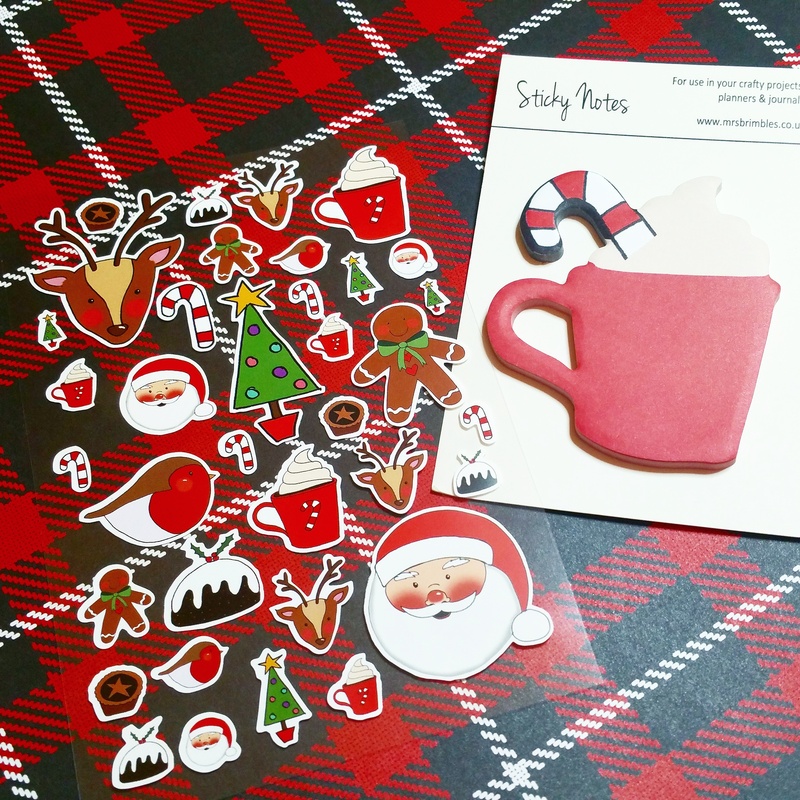 Having the cute stickers and taking the time to decorate started to make me feel good about the holidays again. I think baby deer are going to be my new thing. In the back of my planner is where I keep my writing journal. The bike sticker is from the October Brimble's Box. I love that The Brimble Box kit comes with journal stickers and phrases. I use them as writing prompts. I will also put them on photos to scrapbook with them later in the month. 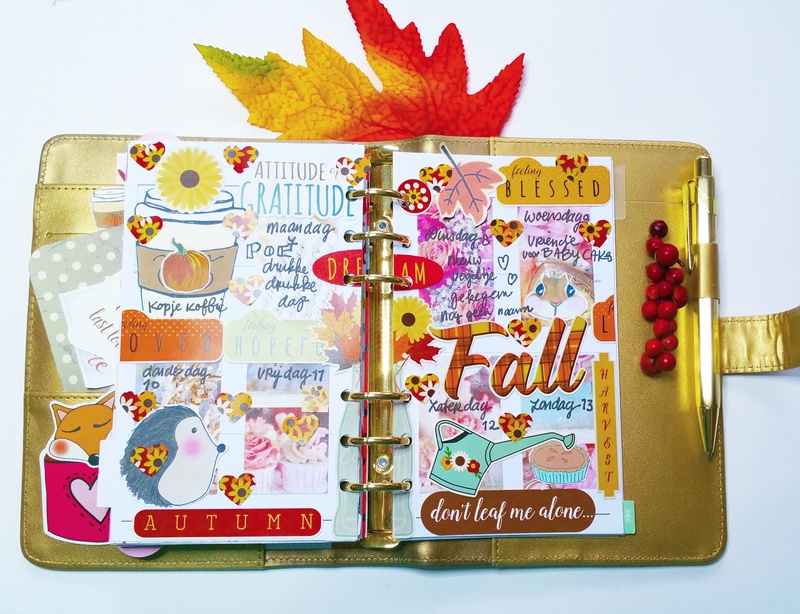 For this journaling page, I decided to use the contents of my September Brimbles Box to decorate it! Since I moved late September I didn't have a chance to dig in and have a play with the box, so I've been looking forward to using the contents for a while! I had a few photo's from a lovely walk I went on by myself to take photo's. This is something I thoroughly enjoy doing, and have always found very relaxing. It seemed like the perfect photo's to use alongside my September Brimbles Box, seeing as the box was themed around feathers, dreaming and feeling free! I loved all the muted colours in this box, it was a nice change from the usual bright colour schemes. The 'young' 'wild' & 'free' stickers came from the 12 x 12 sheet of stickers in the box, and I used my watercolour palette that I'd also bought from the Mrs Brimbles shop, to pop a splash of yellow down behind the photo. Seeing as the word stickers had an outline of white, the yellow helped them to stand out from the white page. I added a strip of feather washi from the box at the top and bottom of the page too, I love this tape! It's perfect to use as a border, but I reckon it'd also work just as well if you were to cut out each individual feather and use them to decorate a page like stickers. I made the postcard that came in the box into a flap on the page. I tend to add flaps when I know I don't have a load of stuff to write about on the page, but if I were to stick two photos on one page and add decoration, then there wouldn't be enough space to write. It just gives that extra little bit of space that's needed. 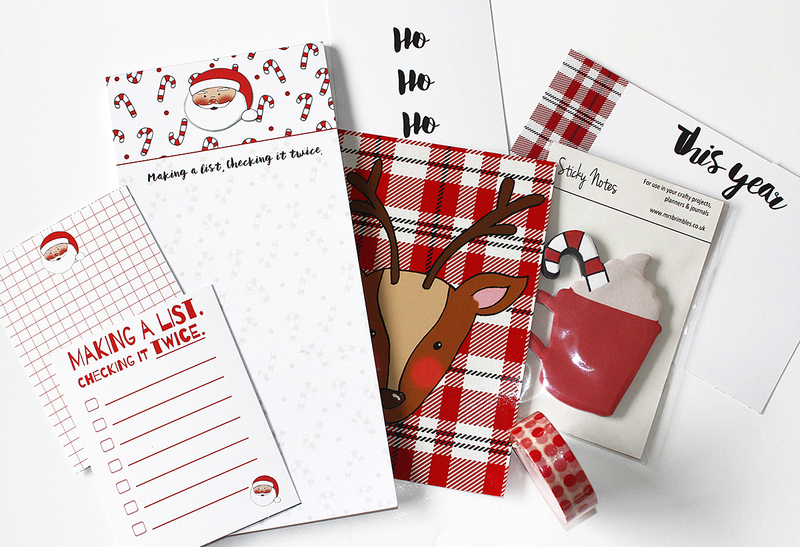 It's a quick and easy addition to a page and postcards are absolutely perfect for this! Sometimes they might need a trim to fit, but this one fit brilliantly. Above is how I decorated the other side of the postcard and the rest of the journal page. I decided not to carry on with the yellow all the way down the page because it might make it all a little too busy once I've added writing on top. On the back of the postcard I stuck down some of the beautiful feather scrapbook paper that was in this box, and then picked out a few die cuts from the ephemera pack that was included to collage around the photo. 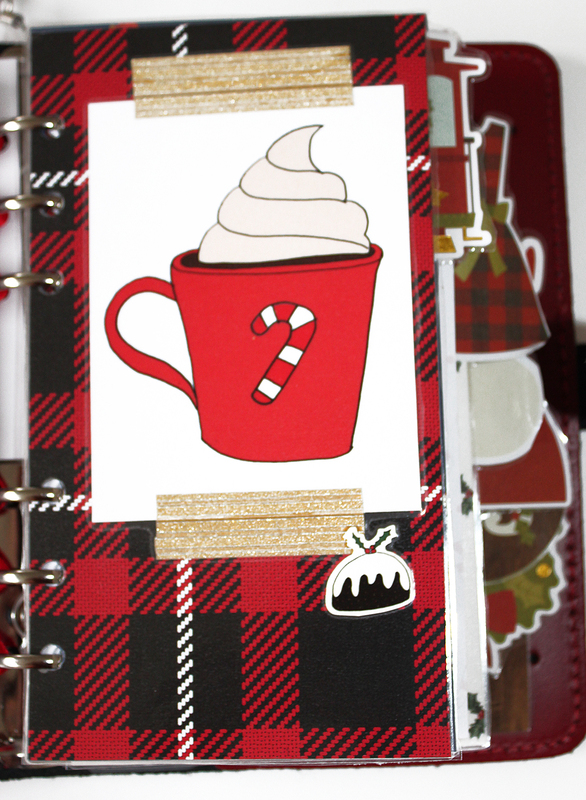 At the bottom of the journaling page I added some of Anna's stickers, along with a die cut and some washi. I also wanted to try out one of stamps from the stamp set that was in the box. Once I'd stamped it I felt like it didn't stand out enough, the lines were quite thin so I had a go at going over them. It turned out okay, but not quite how I imagined in my mind. It's all good though! Journaling like this gives me a chance to learn and experiment with supplies, so I added some colour to the pinwheel and left it. 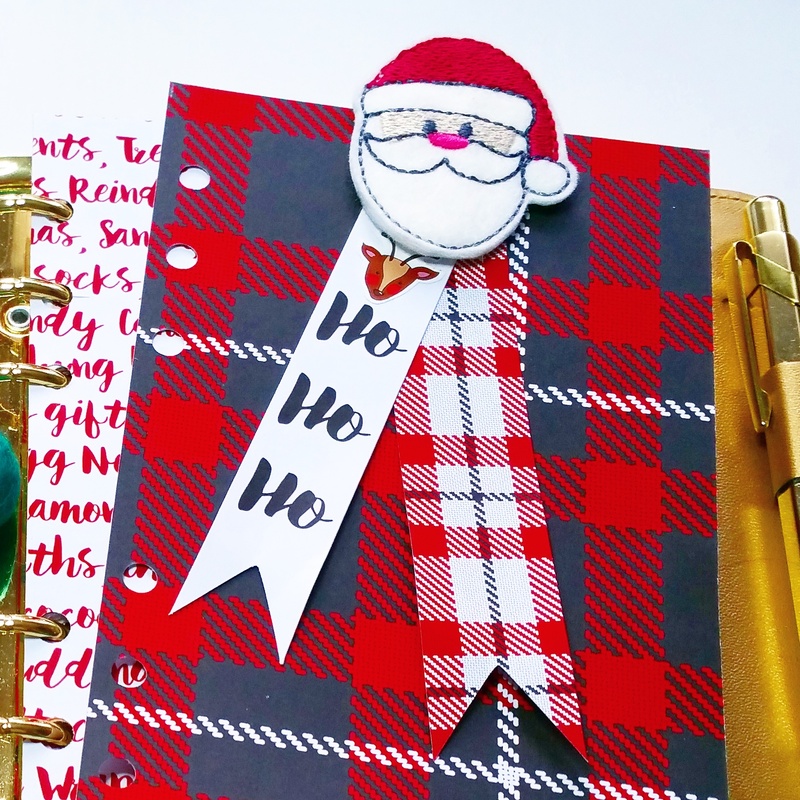 He sees you when you're sleeping, he knows when you're awake... Well that's only possible when Santa is on top of my biggest Planner... My Happy Planner. Even when my planner is closed he peeks out and watches me. 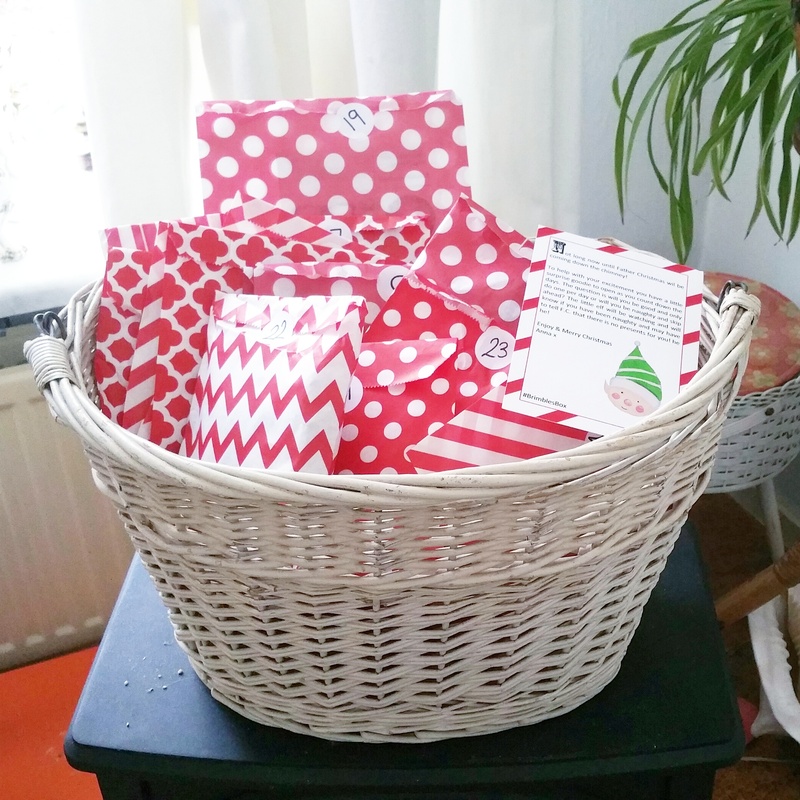 This month Brimble's box is obviously Chrismas and red/white themed. I love how those colors pop! I made some spreads ahead and that made me feel all Chrismassy instandly. 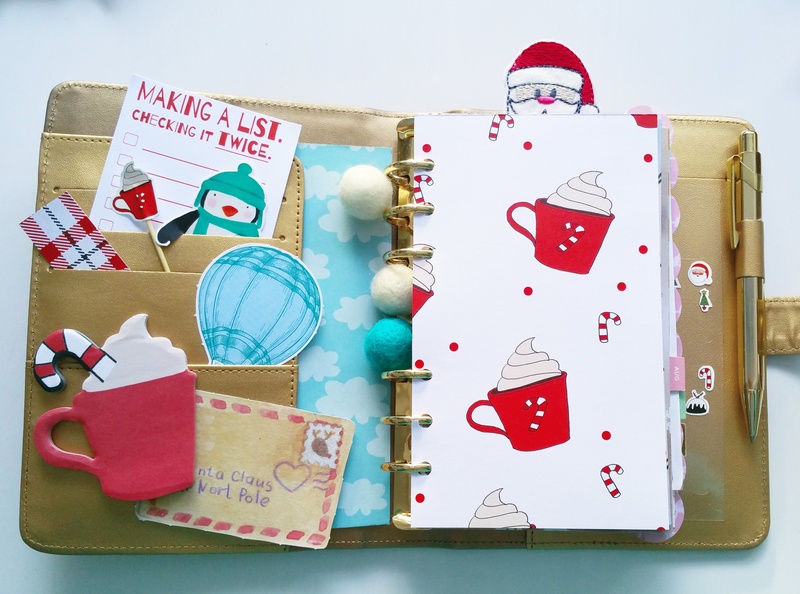 Even Santa moved from planner to planner to check if I did my best to make cute things. 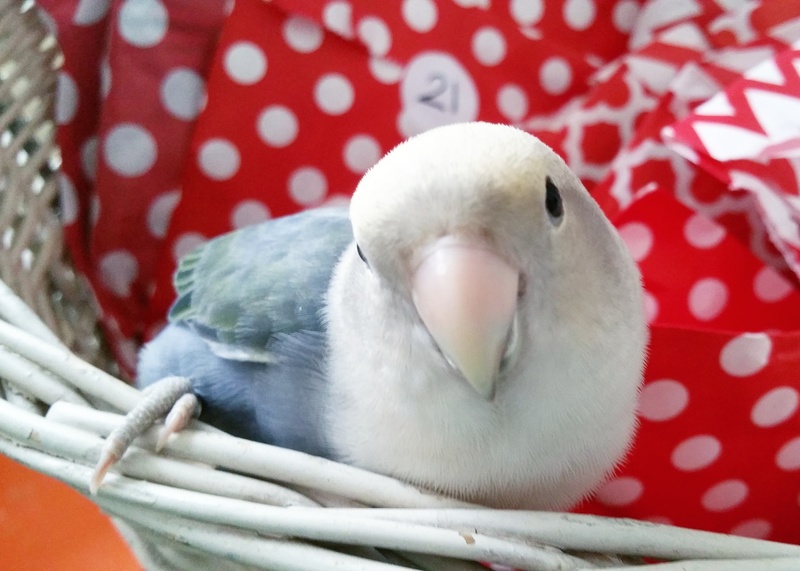 Baby Cakes (my love bird) really liked the Mrs. Brimble's stationary advent box. She wanted to open the presents right away. I told her to wait till the first of December. Instead I gave her some scrapbook paper to play with. She's a girly girl so she shredded it up and put the pieces of paper between her feathers to bring them to her nest. And I loooooove Mrs. Brimble's stickers! The white outline makes them realy pop! And how about the tippical English chequered print? It totally fits the theme. There is so many scrapbook paper this month so I made myself several dashboards out of it for diffetent planners. And I still got some paper left. It was not even possible to put everything from the November box in one picture. The enamel figures look like they can be served with a cup of tea. Little chocolats. So cute and delicious! I decided to leave the monthly page mostly white in my Happy Planner because after all Christmas is all about snow... even if there is no snow at all. I love the difference between the Autumnal and the Christmas colors... In fact every month is a surprise... altough I try to fit in Pink every season because without Pink I don't feel complete hehehe... I'm serious. For that reason I'm looking forward to Spring... That's when we can immerse ourselves in pastels... Yasss! This is last month October kit but I still wanted to share it with you because it was the first time I did a 'sticker dump' with all my 'left over stickers' and it turned out pretty cool I think. See you next month! December Instagram Challenge is back for 2016! You guys have asked if I will be doing another instagram challenege for December. Errrrr yeah! 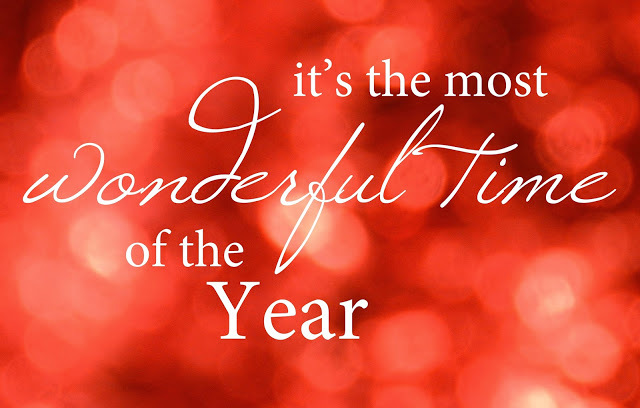 It is totally and utterly my favourite time of year so of course, I can't wait! I love seeing all of your photos especially the seasonal ones! The December challenge is now in it's 3rd year can you believe!!! 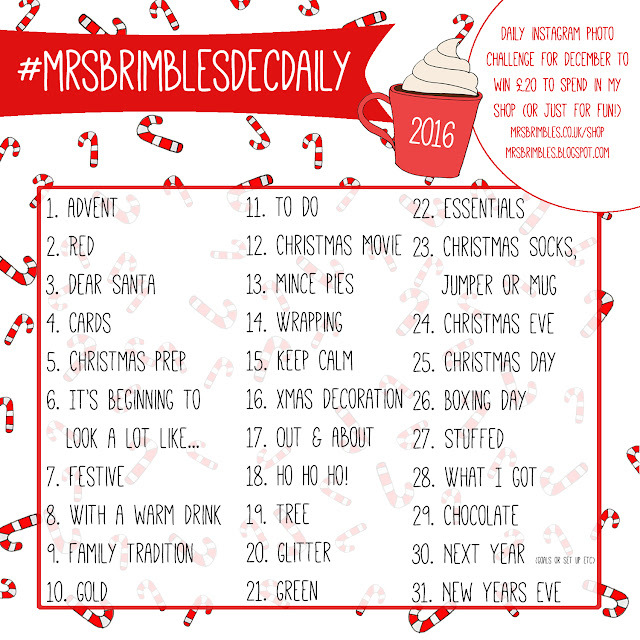 You must post all 31 photos on instagram using #mrsbrimblesDECdaily you may also want to use #mrsbrimblesDECdaily2016 (although not compulsory) as the challenge is now in it's 3rd year! You have until 7am GMT on 5th January 2017 to register for the giveaway on the widget below AND to complete the photo challenge on instagram. If you haven't registered on the widget you won't be elligible to win the prize so you will just be doing the challenge for fun which is totally fine with me if it is with you.You can register at any time from now but photo posting on instagram starts on 1st December 2016. You DO NOT have to post everyday but you do have to post all 31 photos by 7am GMT on 5th January 2017. You DO NOT have to post in numerical order, you can post any prompt on any day and any number of photos on any day. Once the competition has closed a winner will be drawn by random using the giveaway widget, and emailed. I will ask you to confirm / prove that you have posted all 31 photos in the time frame 1st December - 5th January 2017, if not another winner will be chosen. The winners name will appear on the giveaway widget once closed. PLEASE NOTE: I purchase this product with my own money. This review is my own personal opionion on the product / company, given in good faith and has not be sponsored or endorsed. None of the links are affiliate links. Unless otherwise stated, all photography is my own. It's Spring here in Australia, and I decided to break out some of the wonderful goodies I've received throughout this year from the Brimbles Box to create some beautiful, bright, Spring-themed planner layout pages. 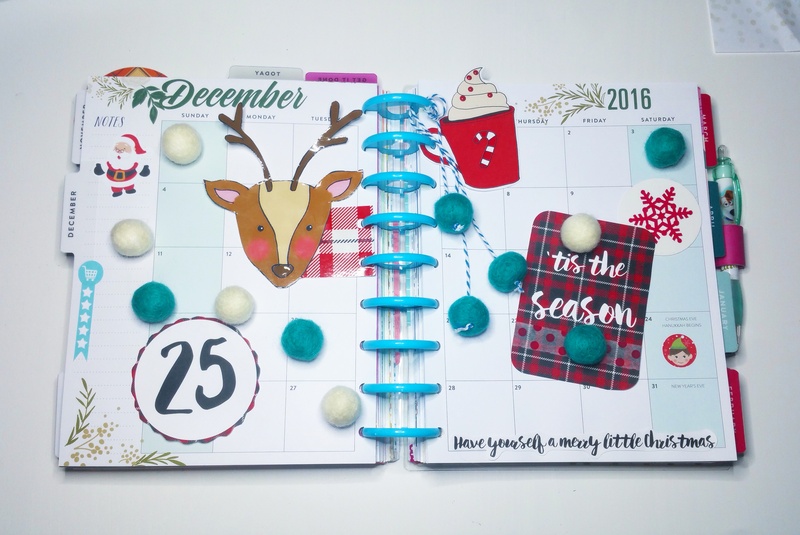 I'm going to be sharing my monthly layout, as well as a weekly layout, using stickers from two Pebbles collections. I know that many of you are well into Autumn/Fall now, but I hope this is a bright bit of inspiration for you all! For my monthly layout, I used stickers from Pebbles' Home Grown collection, as well as some washi tape that Anna sent out over a few different boxes this year (including the pink floral and gold confetti tapes). I've had all of these items sitting in my craft pile since I received them and I love pulling them back out, a few months later, and using them again! 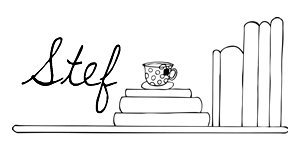 And then I pulled out the Pebbles Front Porch stickers and made a weekly layout, perfect for my book-loving, Spring-loving self! The washi tapes in this layout are actually from Kikki.K, and I was gifted those a few months back, but the stickers came in one of Anna's previous boxes and they are some of my absolute favourite stickers. I was determined to use the book stickers because over the last few months I've gotten back into reading after a long time of not reading for myself and this layout just makes me feel like myself! I hope that no matter what season you are in that you are well and having a wonderful, crafty time! I already had my Pillar box red Original Filofax in Personal waiting for this! 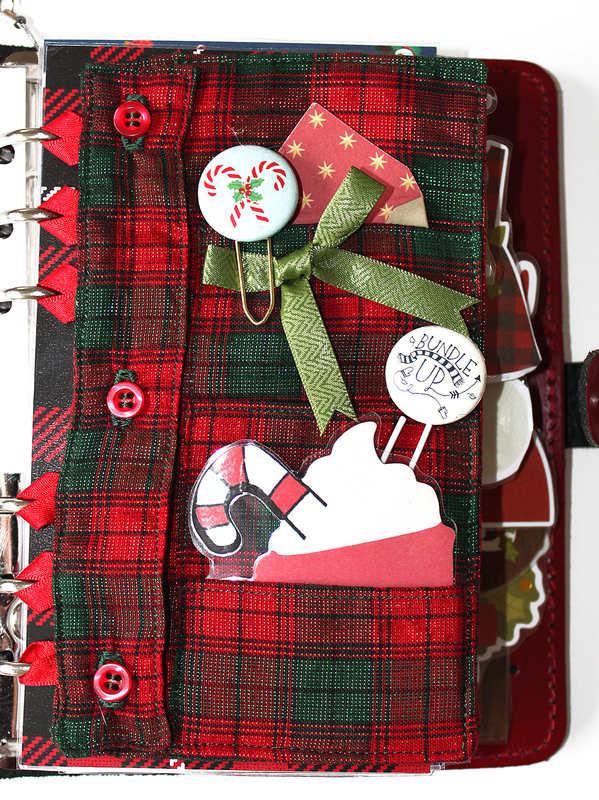 I have included other items in my planner setup, some from the Brimbles shop/past boxes, some from other shops. I will link everything (if the items no longer exist for sale, I will link the shop). 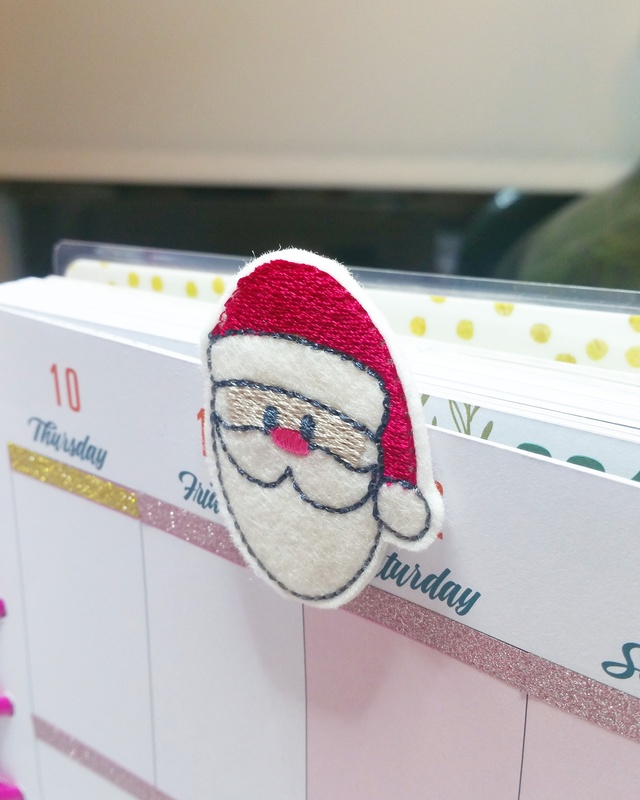 One little thing I want to show is the Santa planner charm I've used. I LOVE this charm. It was in last years November Brimbles box. I had it ready and waiting haha. So my dashboard! I wanted it to explode Christmas but also have a traditional feel. There's quite a bit in my dashboard section. So to begin on the left hand side. At the moment I've chosen a black Inkjoy pen, nothing fancy but I like the way it writes. I've taken a section of scrapbook paper from Anna's 12x12 designs, I love this plaid pattern. It works so well for what I wanted to capture in my planner. In front of that I have a series of paperclips, the round ones were from Mrs Brimbles shop. They were tin pin embellishments that I turned into paperclips. The Santa is by Cherry Blossom in the Market Square. The ribbon is by Santoro and the envelope is by Docrafts. 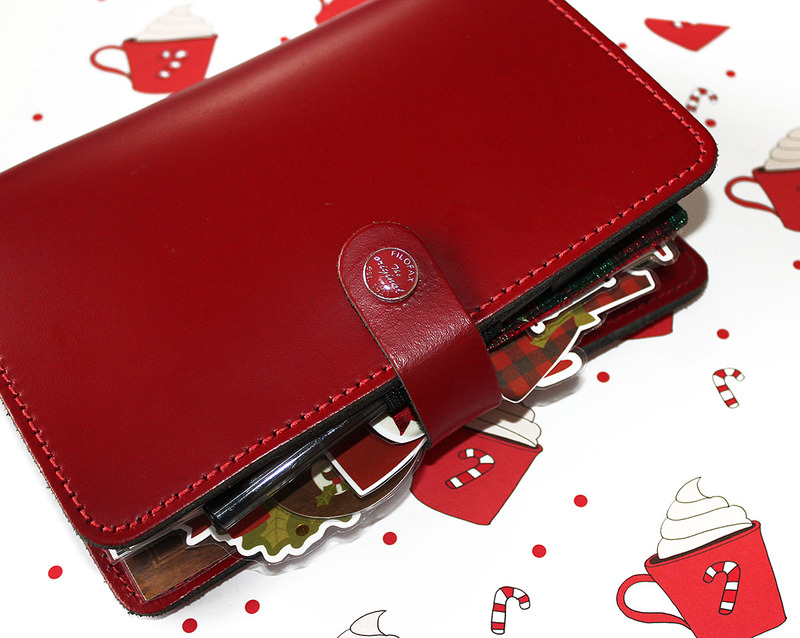 I've then taken one of the journal cards (cut from the 12x12 sheet) and added it to the back pocket. On the right I have layers and pockets! Two of my favourite things! At the front I have another journal card which I've laminated and punched into the planner. It has that gorgeous pattern and a huge 25 on it! Best day of December! Underneath this I have a planner pocket made by The Sew Unique I bought this at the UKPA Big Meet. I'd seen teaser images for this product previously and made a beeline for them. This one caught my eye straight away. Again it has the pattern I was after, the colours are rich but it also has shimmery fabric. It's beautiful. It has three pockets with the top one being quite deep. I've decorated it with the same products seen on the other side of the dashboard. I've also laminated one of the sticky notes and added that. Behind this pocket, I have another dashboard section! This is a section from the 12x12 scrapbook paper cut down to personal size. One of my favourite journal cards from the selection has been added here, the cup. 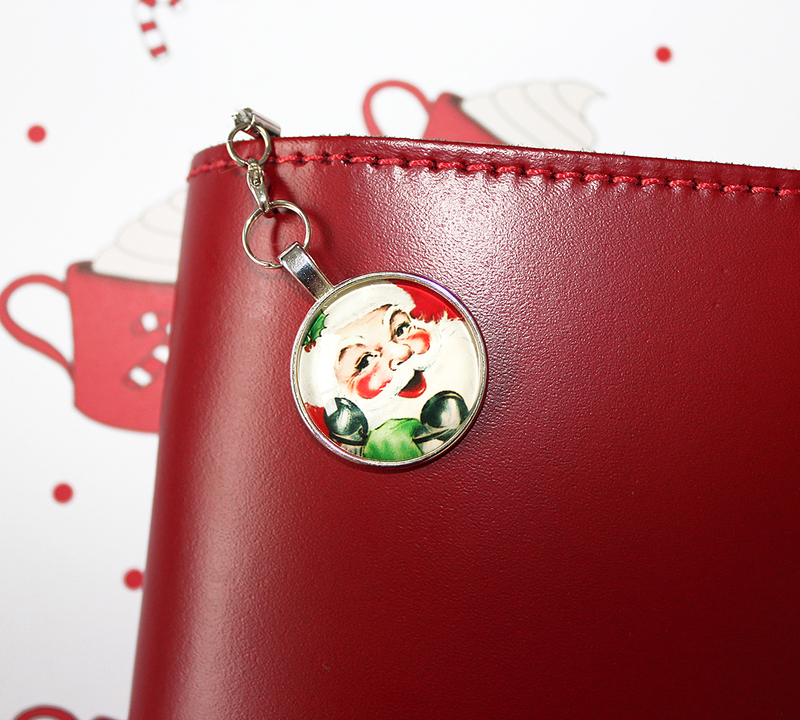 This is held down with gold washi from my shop and there's a little Christmas pudding sticker from this months box. Behind this I have a few more bits before you get into the planner. Another laminated journal card ( I can't get enough of them!) and the list pad paper. I've cut this down to fit and punched it. It'll be used as a quick notes section. Onto the nitty gritty of the planner. 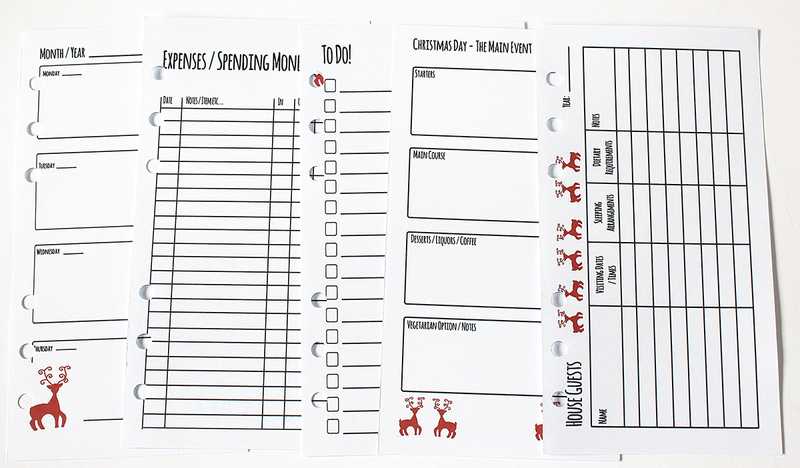 I have been meaning to make my own Christmas Planner inserts but it hasn't happened. It's been a busy month with lots of changes, I've decided to stick to a sticker kit. 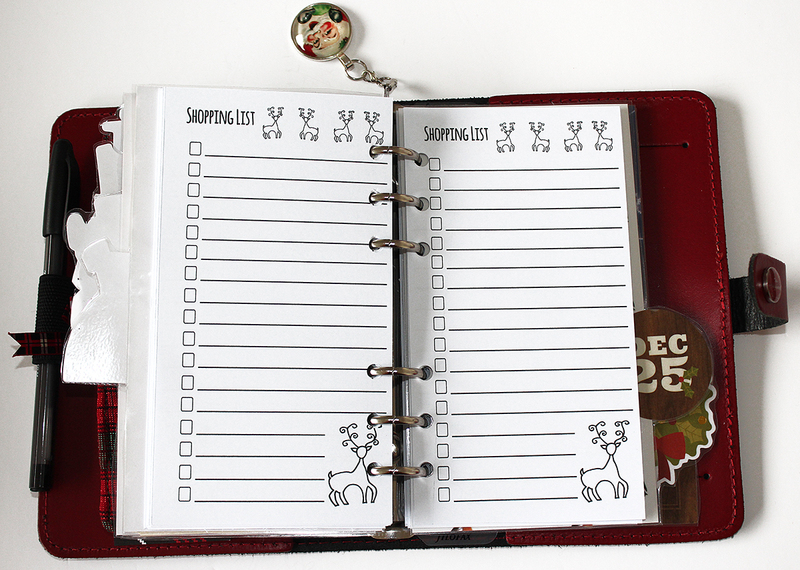 To be released soon ;) But I needed planner inserts! I do prefer using other people's work, perhaps it's because I spend SO much time looking at my own work. I knew Anna had inserts on her Etsy shop for a whole range of things. 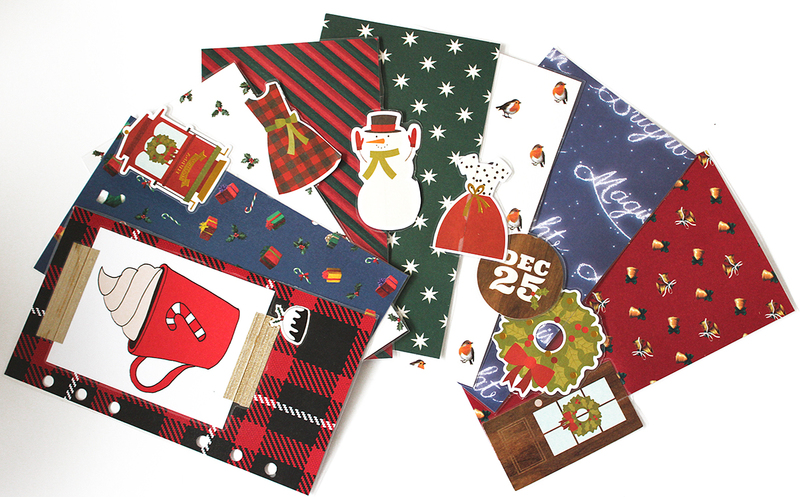 I'd been eyeing up the Christmas inserts last year and decided this year, I needed them. You get loads for your money! You can setup your entire planner! 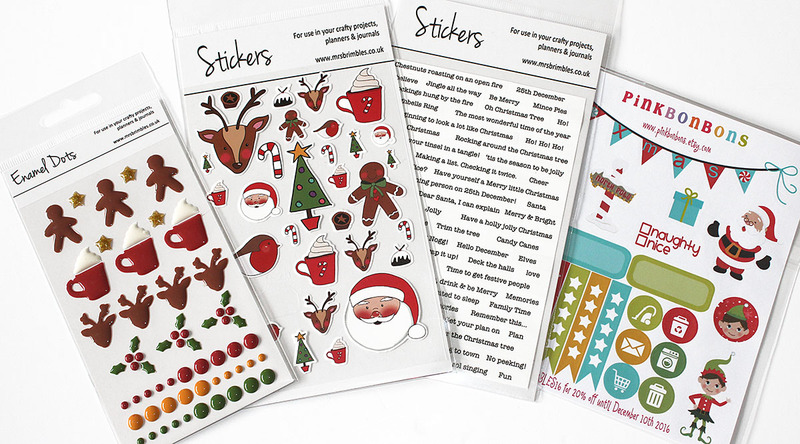 There's two designs to choose from, a Gingerbread Man or a Deer. I decided to go for the Deer as it matched this planner setup. 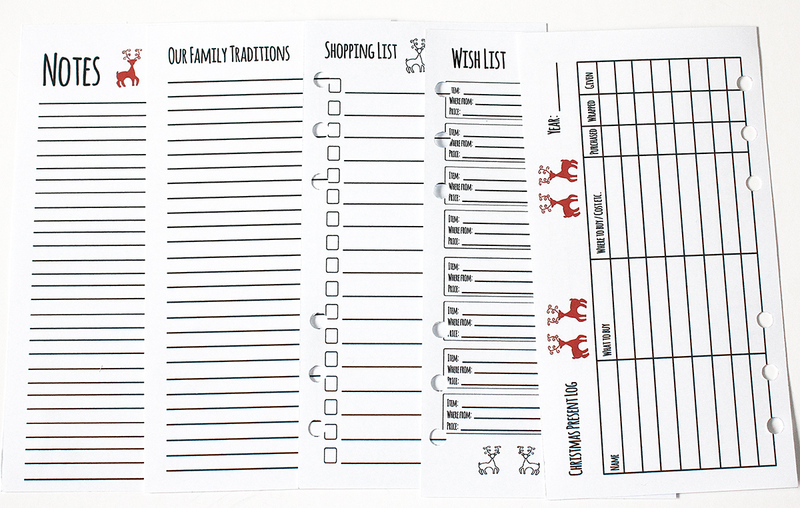 It is a download, as mentioned I make my own planner inserts so a download works well for me. The last thing to show you from the planner setup are the dividers. 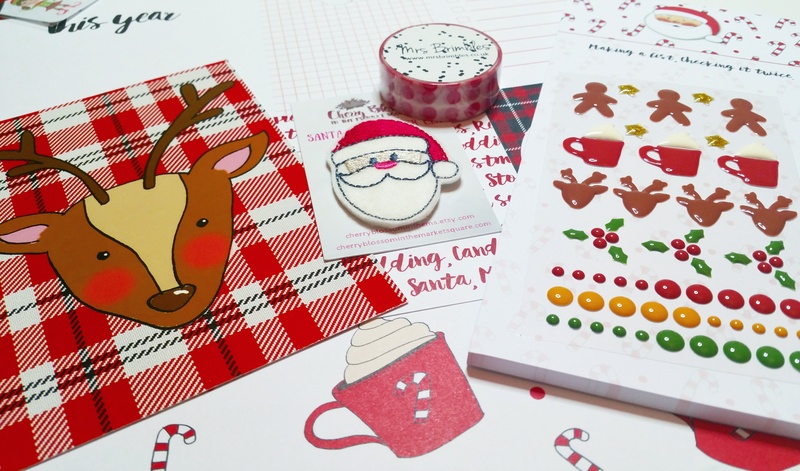 These have scrapbook paper from the September Docrafts goody bag. I could have used the 12x12 scrapbook papers but I want to save the rest for TN dividers. The tabs were bought from Mrs Brimbles shop. I've purposely not labelled these. When I've used this method before, I find that I start to recognise the ephemera for the section included. I love how they've turned out, so festive! So that's what I've done with this months box so far and my Christmas planner setup!